"Above the Sea Tower snapped his father's banner. The Myraham was too far off for Theon to see more than the cloth itself, but he knew the device it bore: the golden kraken of House Greyjoy, arms writhing and reaching against a black field. The banner streamed from an iron mast, shivering and twisting as the wind gusted, like a bird struggling to take flight." This Iron Island appetizer was conceived for my Game of Thrones Season 7 Party. For this menu, I served nine courses, each inspired by one of the Great Houses. This course was one of the first that I finalized; when something so obviously edible as the Greyjoy's squid (well, Kraken...) is on the banner, the choice is easy! 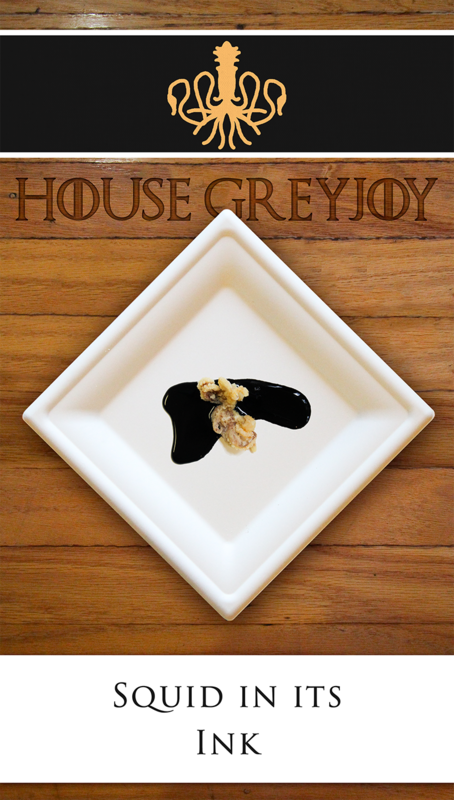 The Greyjoy colors are black and gold, which also translate straightforwardly into a squid-based dish. Raw squid like you might encounter is sushi is an off-white color, but in its deep-fried state - perhaps more commonly known as calamari - the breading lends the squid the golden hue I desired. While black food is not particularly common, one of the blackest foods just happens to be perfectly thematic: squid ink! Squid ink has a salty and faintly marine flavor without being strongly fishy. I was able to find it at my local grocery store in the frozen fish section, but it is also available on Amazon and at specialty fish shops. The color is powerful - I bought more than I needed to color the sauce appropriately. For the rest of the sauce, I chose to keep it simple. I added lemon juice, which I really like with calamari. I shied away from using a roux to thicken the squid sauce; I didn't want to wind up with a grey sauce. Instead, I used gelatin to thicken the sauce. Gelatin is easy to work with, won't alter the color of the sauce, and adds a rich mouthfeel. The presentation of the dish is very striking, and certainly evocative of the Greyjoy banners flying in the iron isles. Pour the broth into a small sauce pan. Sprinkle the gelatin over the broth and wait 2-3 minutes for it to hydrate. Stir in the lemon juice and squid ink. Heat gently to serving temperature to check for consistency. The gelatin mixture will be more solid at room temperature and more liquid at high temperatures. Thin with additional broth as necessary. Coat the bottom of a large heavy pot suitable for deep frying with 3 inches of vegetable oil. Bring the oil to 350°F over medium heat. Prepare a wire rack topped with paper towel for collecting excess oil from the fried squid. Meanwhile, mix together the starch, salt and spices in a plastic bag. Gently pat dry each piece of squid, leaving just enough moisture behind to allow the flour mixture to stick. Toss the squid pieces in the flour mixture and shake of any excess. Carefully place the squid in the heated oil and fry until crispy and golden. With tongs or chopsticks, remove the squid and place on the wire rack to cool for a minute. Spoon a table spoon or two onto each place, and arrange squid pieces on top.